Northern Electric model 5508 "Midge"
Bakelite "AA5" chassis with green hammer-tone enamel. Also known as the "Bullet". Appearance is identical to a Farnsworth GT-051 which has a different chassis. The GT-051 uses octal tubes, and a smaller-value filter capacitor, whereas the Midge uses miniature tubes. 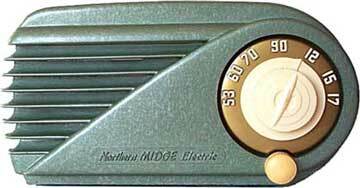 Dec. 6/2000 update - There's also a "Roamer", the model L660 by Lifco Record Players and Radio Mfg. Inc., but that may indeed be made by Northern Electric. Some more detective work is required. I believe the name "Midge" is not intended to be an abbreviation of "midget" (which some have suggested) but rather the nickname of a small biting flying insect, (aka "sandfly" or "no-seeum") which is notorious for its abundance in Northern forests. I could not resist that aerodynamic styling and the "go-faster stripes" on the speaker grille. The cabinet and dial cleaned up very nicely, using a toothbrush and a rag with a bit of kitchen counter-top type cream cleanser. I had to use a toothpick to clean out the raised lettering. The gold reverse-painted plastic ring came out after I filed off a couple of little nubs that they put on the back of the ring. They simply heated a few spots until they melted, and pushed them out a bit. I used a few little dabs of hot-melt glue to hold it in place. July 2001: I finally got around to re-capping it, so it does sound better. I haven't tried aligning the IF coils yet.